It's Facebook Fridays! for March 27, 2015, and we want to help you change your bad luck to good! 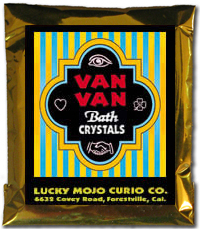 The Lucky Mojo Curio Co. is hosting a random drawing to give away 5 classic Van Van spiritual supply prizes to clear away evil messes, rid yourself of jinxes, provide magical protection, and open your road to new prospects. Van Van is a 19th century hoodoo formula highly regarded as the best all-around oil for dressing amulets, talismans, or lucky charms. 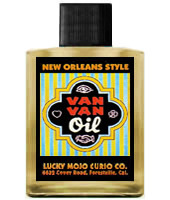 This week we are giving away FIVE prizes, each of which includes a bottle of our famous hand-made Lucky Mojo Van Van Oil plus a packet of Lucky Mojo Van Van Bath Crystals for floor washes and baths. First thing tomorrow morning, we will select FIVE winners at random, announce their names here, and ask them to message this Facebook Page with their mailing addresses, so we can send them their FREE Van Van products. Thank you Ernie -- good job, as always, and i hope folks here on the Forum are getting into the idea that these free giveaways take place EVERY FRIDAY and that they get on over to the Lucky Mojo Facebook page and enter to win! We have a winner! In fact, we have 5 lucky winners! Our Facebook Fridays! winners for March 27, 2015 are: Tara C. [Surname deleted by request], Bill Clark, Regina Fiore Linneman, Gayle P. Coleman, and Artemisia Officinalis.